Digital signatures can be used for many types of documents where traditional pen-and-ink signatures were used in the past. However, the mere existence of a digital signature is not adequate assurance that a document is what it appears to be. Moreover, government and enterprise settings often need to impose additional constraints on their signature workflows, such as restricting user choices and document behavior during and after signing. 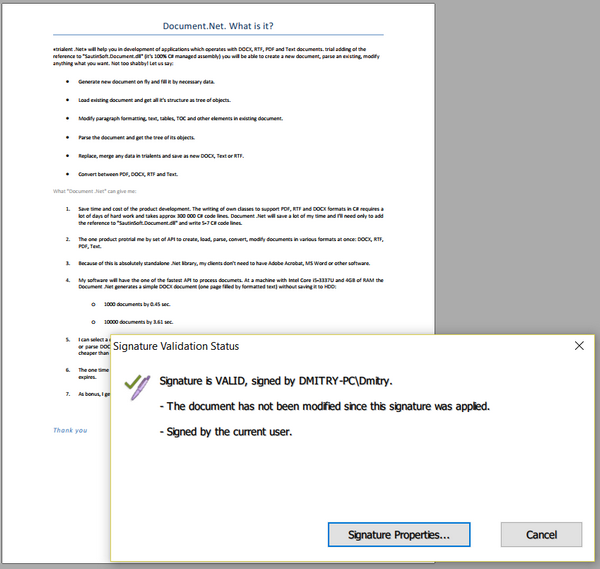 The following example shows how to create a digitally signed PDF document. Create a new invisible Shape for the digital signature. Place the Shape into top-left corner (0 mm, 0 mm) of page. // Find a first paragraph and insert our Shape inside it. // Picture which symbolizes a handwritten signature. // 14.5 cm from Top of the Shape. // 4.5 cm from Left of the Shape. And the last step is to point of a certificate (*.pfx) and its characteristics: Password of the certificate, Contact Info, etc. // Path to the certificate (*.pfx). // The password for the certificate. // Each certificate is protected by a password. // The reason is to prevent unauthorized the using of the certificate. // Additional information about the certificate. // Placeholder where signature should be visualized. // Visual representation of digital signature. As the result, you will get the digitally signed PDF document. /// Load an existing document (*.docx, *.rtf, *.pdf, *.html, *.txt, *.pdf) and save it in a PDF document with the digital signature. // Create a new invisible Shape for the digital signature. // Place the Shape into top-left corner (0 mm, 0 mm) of page.
''' Load an existing document (*.docx, *.rtf, *.pdf, *.html, *.txt, *.pdf) and save it in a PDF document with the digital signature. Dim loadPath As String = "..\digitalsignature.docx"
Dim savePath As String = "Result.pdf"
' Create a new invisible Shape for the digital signature.
' Place the Shape into top-left corner (0 mm, 0 mm) of page.
' Find a first paragraph and insert our Shape inside it.
' Picture which symbolizes a handwritten signature.
' 14.5 cm from Top of the Shape.
' 4.5 cm from Left of the Shape.
' Path to the certificate (*.pfx).
' The password for the certificate.
' Each certificate is protected by a password.
' The reason is to prevent unauthorized the using of the certificate.
' Additional information about the certificate. 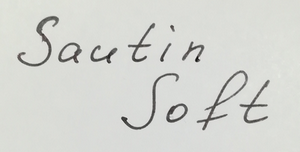 options.DigitalSignature.Location = "World Wide Web"
options.DigitalSignature.Reason = "Document.Net by SautinSoft"
' Placeholder where signature should be visualized.
' Visual representation of digital signature.